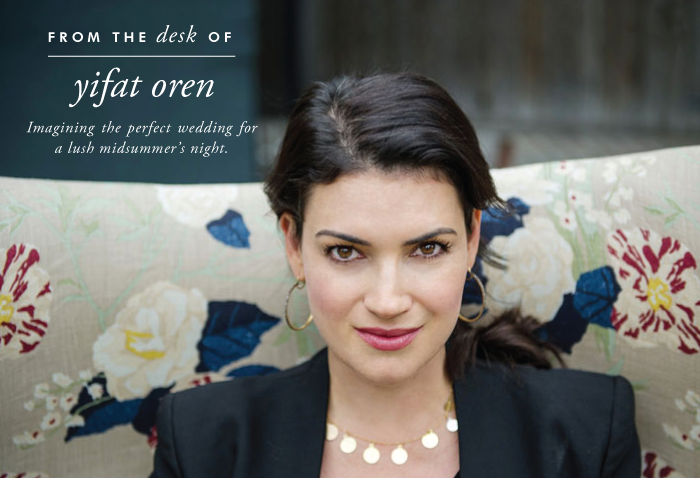 Los Angeles-based event planner Yifat Oren is known for impeccable weddings with a distinctive sense of style and sophistication. Oren selected invitations from our collection that call to mind a secret garden at dusk—perfect for a romantic summer reception. Design Floral Trellis II and Gwendolyn II on paperlesspost.com. Clockwise from the top left: Skirt cloth, Victoria and Albert Museum (1880); plum blossom wallpaper, de Gournay; lightning ridge opal necklace, Irene Neuwirth Jewelry; flowers (unknown source); boulder opal ring, Brooke Gregson; Kawachi Fuji Gardens, Japan; Laurence Amelie; agate (unknown source); color reform silk rug, ABC Home.